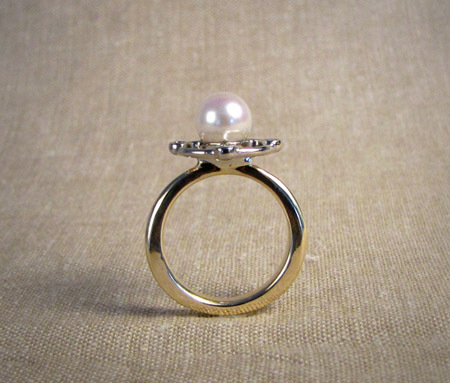 This ring came into being when Ghezal sent me a pair of stud earrings she never wore. 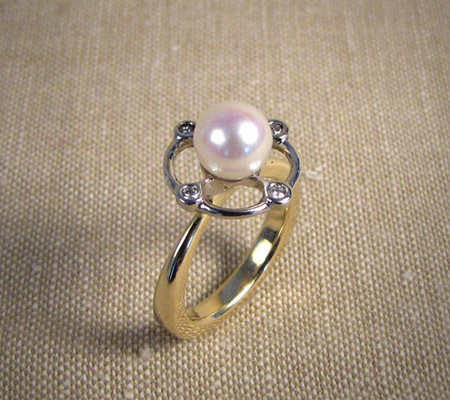 The pearls were petite Japanese akoyas, and too small for the pearl ring designs I had (I typically use Tahitian and South Sea pearls, which are from a much larger oyster). I dinked around with some ideas and even carved something that seemed good in my mind, but actualized in purple wax, it was kind of ugly. Then Ghezal said she wanted diamonds too and sent me an old diamond cluster cocktail ring to disassemble. Nothing like a passel of diamonds to sparkle up one’s imagination, and I reworked the design into more of an art deco inspired piece. She also casually mentioned she wanted it two-tone: white gold where the diamonds are and yellow gold for the band part, which at first freaked me out but it turned out to be not as hard as I thought it would be and of course, it’s pretty much awesome. This entry was posted on Saturday, July 3rd, 2010 at 8:01 am	and is filed under Uncategorized. You can follow any responses to this entry through the RSS 2.0 feed. You can leave a response, or trackback from your own site. This might be one of my favorites. 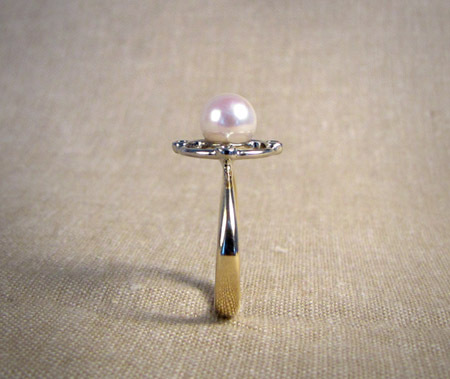 That is what you do with a boring little pearl stud – beautiful. LOVE this! 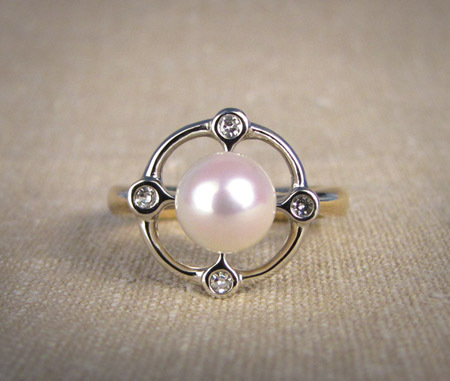 Perhaps a new line of deco rings in the works?